A guide dog is a life changing experience for many blind individuals. A companion that literally guides the blind person around the world he/she walks on. It gives a blind individual the confidence to be independent. It is especially life changing for someone like myself who is deaf and blind. My name is Riley. I was born with Golden-har syndrome, along with some other challenges. For me it means I am profoundly deaf and legally blind and I communicate with sign language and technologies. 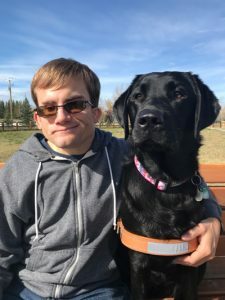 I would like to thank everyone from BC & Alberta Guide Dogs and the donors from the bottom of my heart – even those who are not involved much – you made this possible for Eileen and I to be a guide dog team. As I am writing this testimony, Eileen sleeps with her head on my feet. It comforts me and keeps me warm, for sure! I have always loved to go out for a walk in the evening and Eileen is amazing. During winter, I often find myself lost and confused – Eileen guides me and lets me know if there are elevation drops (like curbs) or obstacles in our path. Before Eileen, I had to ask someone to drive me to certain locations when it was dark and during the winter. No longer. She has allowed me to be much more independent in my everyday life. There are always unexpected situations, Eileen is great with that! She gives me much needed confidence to navigate crowded malls, transit stations, college/university halls, grocery stores, downtown, etc. She picks up things very fast – I’m talking about teaching her new commands that she learned within a day. Believe it or not, Eileen understands sign language commands! We have a great bond, I look forward to our journey together.